1.) I hate the idea of giving up Olivia. Maybe I have too much attachment to the car or the woman she’s named after but while it’s far from the perfect car it’s a car I know and it’s hard to complain about the 250 HP even being an old midsize CUV. 2.) I especially the hate the idea of trading it in for another damn Hyundai product but it looks like it’s going to be the Tucson. Needless to say I much rather have the “Jalopnik CUV special” CX-5. Of the two even remote possibilities I’m stuck with it and the Tucson are admittedly the best looking choices out there (in fact you pretty much have to upgrade to a performance luxury brand to find better-looking). The CX-5 rides and drives much more engagingly, a vast improvement over the one quality of the Santa Fe I detest the most. The Tucson...goes faster if you get the Sport engine and that’s it. I’ve been told if you want to achieve the Eco-spec’s fuel economy you just hit the Eco button on the Sport, and I’ve managed to convince my dad that the 19-inch wheels are worth it because both CUVs look stupid with the smaller wheel size. I’m sorry they just do. In some aspects the Tucson actually manages to look better, although I hate the hood crease, I wish it was more subtle like on the current BMW design language and regardless if it’s a Tucson or CX-5 it’ll become the best-looking car in the family garage right now. 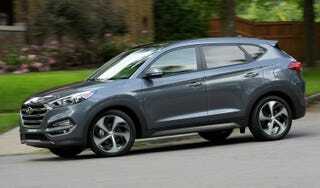 But whatever, it looks like it’s going to be a Tucson, so regale me with all the good qualities that CUV has. But if it were up to me we’d be waiting for the next-gen Impreza which has all the AWD we need but I have to accommodate Baby Boomer hip joints so CUV it is. Also feel free to school me on how creepy it is to name the family car after an old girlfriend and how I need to get over it. Guh.